After two dramatic Conference Finals, the dust has settled to reveal ... the Golden State Warriors and the Cleveland Cavaliers. Well, at least the Irving-less Celtics and Rockets (short of Chris Paul for Games 6 and 7) gave it their all. With these teams battling for the fourth straight time, people want to know if the Cavs can even up the score at 2-2. While last year's Finals had a bit more drama, what with Durant chasing his first ring and the Dubs trying to take get back on track after blowing a 3-1 lead, this year's go around still has plenty going on. With a Cavs win, LeBron may stick around in Cleveland for another few seasons. However, the Warriors can really solidify the dynasty they've built with their third championship in four years. 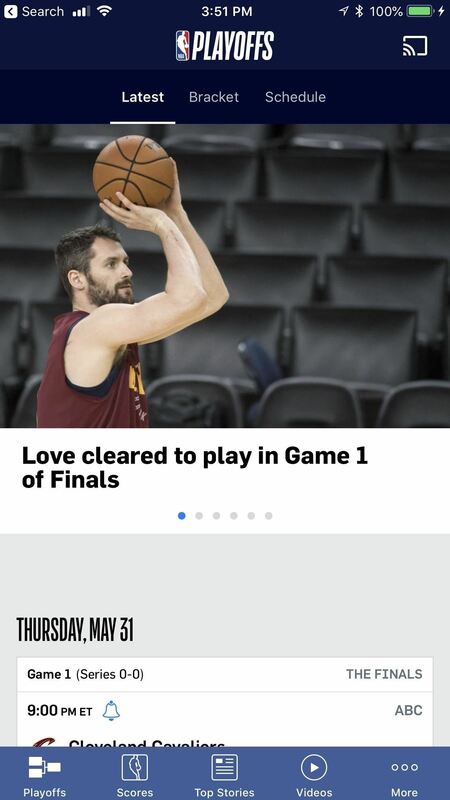 While anyone with a TV will be able to watch the nationally televised games on ABC, you want to know the best ways to watch the NBA Finals on your Android or iPhone — and you don't want to pay for it either. That's not a problem, because there are plenty of ways to watch the Cavs lose for free. Since not all ABC affiliates are available for streaming in every area, the most sure-fire way to stream the NBA Finals is through WatchESPN. If you have compatible subscriptions, you'll be able to watch the game in any US market, as Disney owns both ABC and ESPN. WatchESPN requires that you have access to ESPN through a cable subscription — but don't worry, all of the new streaming cable options are compatible, and they each offer free trials. So to start, begin a trial with either YouTube TV, Hulu with Live TV, Playstation Vue, Sling TV, or DirecTV Now, and make sure to pick a tier that offers ESPN. All of the tiers for YouTube TV, Hulu with Live TV, Playstation Vue, and DirecTV Now have ESPN, but only the "Orange" and "Orange + Blue" Sling TV tiers come with it. Once you install Watch ESPN, tap the settings button in the top-right corner, then hit "Choose Provider." Afterwards, choose the streaming service that you signed up for just now and provide your login credentials. Once you log in, you can freely watch the NBA Finals. The Finals can last as long as 18 days, so if the series goes 7 games (yeah right ... sorry Cavs fans, but KD ruined the NBA), you'll need to sign up for a few of these services and take advantage of seven day trials for each — just remember to cancel the subscriptions on time. The second method works much the same way as the first method, but it won't work for everyone. All of the streaming cable services mentioned above have deals with some ABC affiliates, which means you can stream the games directly without using WatchESPN — but only in select markets. So check either YouTube TV, Hulu with Live TV, Playstation Vue, Sling TV, or DirecTV Now, and put in your ZIP code to see if ABC is available in your area. If it is, you can stream the games without using the WatchESPN app. 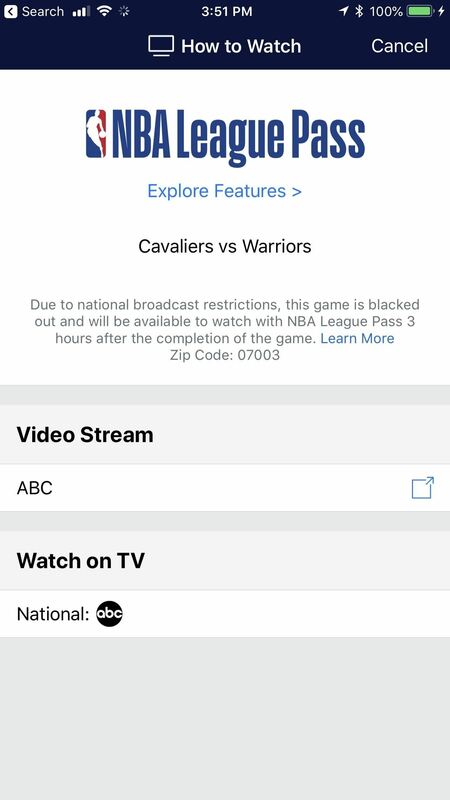 This is probably the worst way to watch the Finals, considering that even if you're a League Pass subscriber, you won't be able to watch the game until 3 hours after it airs. Still, without a subscription, you can listen to live radio broadcast of the game for free, which is really nice. If these options don't exactly suit you, then try reaching out to some friends and family and see if you can use their cable login information to get access to WatchESPN by choosing their cable provider in Method 2 and entering their info instead of yours. You can also do the same with the NBA app, though those subscriptions are harder to come by than your run-of-the mill cable one. If you happen to be watching the game at a loud bar, then you can use Tunity to listen to it for free. There are also going to be a plethora of illegal streams that you can watch the game on. There's even a whole corner of Reddit that's been carved out for NBA streams. Keep in mind some of these can contain malware and the like, so use with caution, and at your own risk.